The Gym app has even greater potential than the body weight app, most especially given the combined benefits of free weight/HIIT training that’s noted in programs such as Crossfit. I’m confused as to why your developers aren’t giving this app the same attention that’s given the body weight app. I could be wrong, but If I’m reading the iTunes app page correctly, there hasn’t been an update within the past 6 months. A good starting point would be iPad compatibility and the addition of dumbbell workouts. Remember that older customers might benefit from free weight and strength training than the burpees, clapping pushups, high jumps, and sprints that are featured in your body weight app. I suspect that the results of such an app improvement/update would certainly result in health improvements among your customers. Please don’t neglect this app! Although your body weight app is very good, give the Gym app the constant attention that it deserves! Once the update is complete, 5-star is a certainty. Thanks for your hard work! Good app but for some reason it still has no option to turn off all the audio. 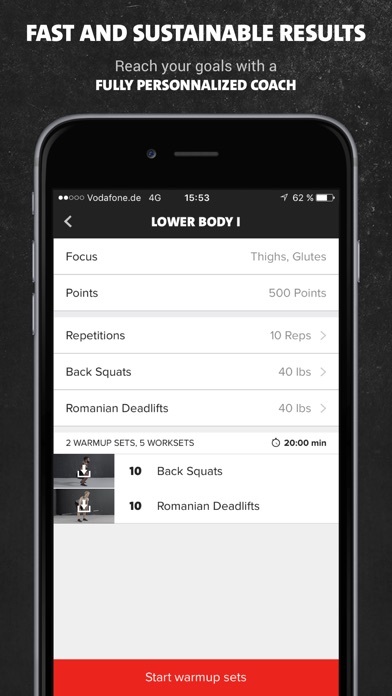 The Bodyweight version of Freeletics fixed this moths ago. Have to pause my headphones every time the app starts counting down to a new exercise. Just put in a mute button! This has been going on for months. I hope someone reads this and makes the simple change! I used a combination of the Gym, Bodyweight, and Running apps from Freeletics to lose 30lbs in about 6 months last year. The apps are intuitive, help you build on your progress, and keep things interesting. I have subscribed for over 3 years and have been very happy with the updates, new workouts, and progress I’ve made. It really works and I recommend it to all my friends who are trying to get off the couch and back in shape. It is a good app. I use it because it come with the pack but it is not nearly as friendly as the Bodyweight app and can use updates. 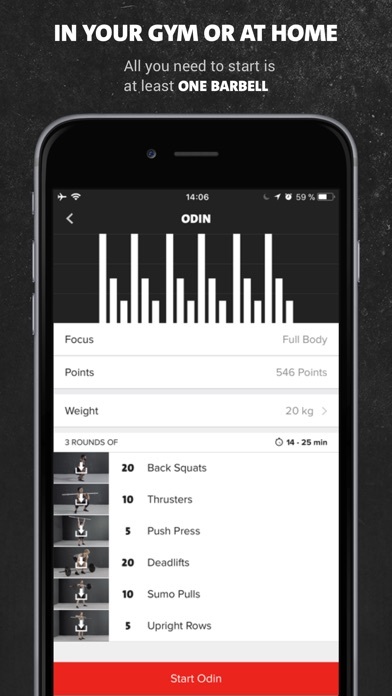 This app is awesome and the workouts are intense. I use this with the Bodyweight app. Would be cool if they were more connected. This is an absolute waste of money. I have been working out consistently for years and I can say these are some of the worst plans I’ve seen. 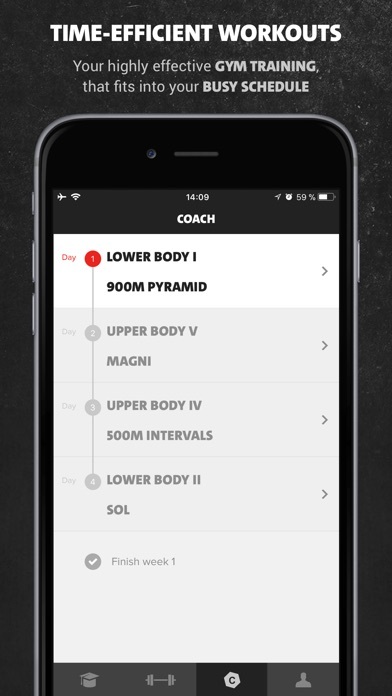 Even with “coach” subscription, there is very little content available on the app and it has a terrible user interface. 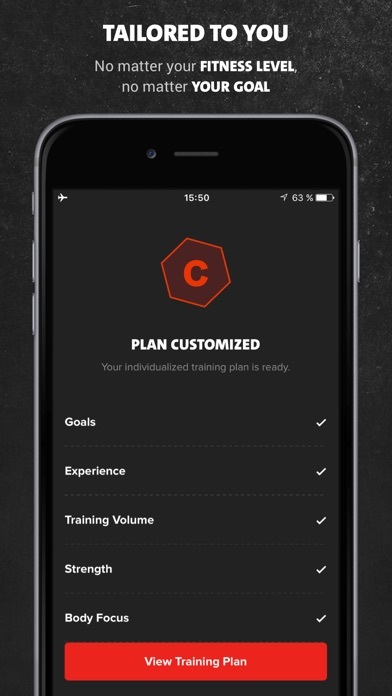 Nothing is customizable and the algorithm for creating the “personalized plans” was clearly written by people who have never been to a gym. Deleted because it requires a login even to check out the app. I love the app but since Apple offered the Health, it is important to have availability to connect sport apps to the health and the Gym app unfortunately does not offer this option. Love it. Easy to use. I don’t have to think about what workout to do. I just need to show up and follow the workout. The workouts make me work too. Not too easy which is nice. I have been telling people to use this app for ages. I love it and have had great progress in my personal fitness using it and the Coach function. I would really like to see an Apple Watch version of it so I could be phone free for my workouts. Name is pretty stupid in that in missleads, “Free”letics? You’ve locked half the workouts, lock that name in a vault with whoever thought it up. Second, it functions as an MVP practically. My first workout didn’t save, but my second workout saved three times, and I have no way of deleting it. Guess I gotta pay for a coach so they can fix it. There are no words for how frustrating this app is. Keeps preventing you from moving around to explore your program. Go back to repeat exercises you have skipped to check what was coming up. And the worst, you can't swap exercises so if a machine they want you to use is not available at your gym, too bad: no swaps. Love it and use it everyday. However, I wish I could skip warm up and stretching with one button, some nice I already memorized the exercises. I decided to download freeletics about 4 months before I got married and the workouts were okay, Gave me some ideas but difficult to follow and keep track during the workouts. My biggest problem was I only wanted it for 6 months. I mean that’s what I chose to pay for...wrong! They were discreet with informing me that it’s an automatic renewal. Didn’t even send me an email that it was going to renew or warn me of the charge coming up, because that’s what scammers do. Their weasels that aren’t upfront or forthcoming on there conniving ways of getting people’s money. Since I wasn’t aware of the charge my card was over drafted and shut down. I requested a refund explaining what happened to my card the day I was charged and they said they were unable to give me a refund. I don’t believe it, I know they can, they just don’t want to. So now I’m stuck with this for another 6 months and I’m telling everyone don’t download freeletics. They have terrible customer service and you should take your business elsewhere. Breaks it down, and keeps it simple. 6 months, 18 lbs down, discovering every day what my body can do and mind can overcome! Thank you! I love Freeletics, have been using it since it first came out and saw some amazing results with the body weight app. But weight training has always been my thing so I was super psyched when the gym app came out and now I have been using it for over a year. I still find it challenging and I have continued to improve and get stronger and be closer to the body I always wanted. This program is quite challenging and well rounded. I would like to see a bit more variety and integration from a program perspective across all apps. Apple Watch app please :). Outside of those notes, I enjoy the programs and workouts. The workouts definitely will build strength and help overall objectives. I would like at least a push notification or something for missing my workout days or goals. It does not keep track of the time taken or missed. This would help give the motivation sought with the personal coach feature. Started out just using the free version and I liked it so much that I purchased a three month subscription. Helps me switch things up a bit with running, gym, and bodyweight workouts. Great app! I love the app. Only thing I really wish were that the 4 apps were integrated. Deeply regret subscribing to this app. It's very buggy and the app doesn't allow you any flexibility to control what info you enter as you do your workout. Examples of bugs: kg vs lbs aren't coded consistently. You're told to do a workout twice (two rounds) but you're not allowed to do so or the instructions aren't clear. This is a trash app; total waste on money purchasing the 'coach' option. Cannot edit or adjust weight amount during workouts - which ENTIRELY defeats the supposed functionality/purpose of the app. Its selling point is the ability to track and adjust workouts to your ability - but that's impossible if you can't track what you are doing while doing the workout. You'd do better just entering your sets and reps in a notepad. Do what the app says. Have a great workout. 1) love the workouts 2) when you switch out of app, it forgets what workout you're on and starts over 3) needs to be better intergrated socially 4) the review of the workouts are useless unless you can click into it and see what you did. I wish i could leave zero star for the review. Be careful they will automatically renew your subcription even there is no subscription under app store.